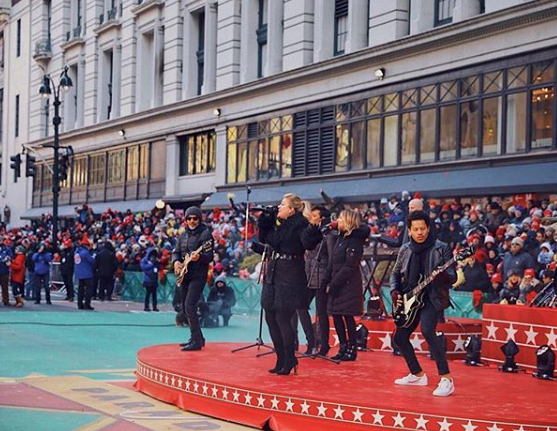 If you were lucky to catch the annual Macy’s Day parade last Thanksgiving, you probably saw Kelly Clarkson’s fearless and jaw-dropping performance of her nuevo classic, “Heat” on the bitterly cold streets of Manhattan backed by her redoubtable band featuring longtime Epiphone Jack Casady Bass fan Kyle Whalum on bass. Although Whalum grew up with professional musicians (his father is legendary tenor saxophonist Kirk Whalum), he didn’t dedicate himself to the bass until he was in his teens. Today, Whalum is a cornerstone of Clarkson’s group, and his melodic and elegant bass lines stand out even to novice listeners. It’s clear from the performance of “Heat” that Clarkson herself draws constant inspiration from her musicians and her bassist in particular, whose formidable job it is to either inspire his band leader or give her space to knock the room out. 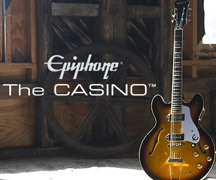 Epiphone.com caught up with Kyle Whalum on the eve of his move from Nashville—his childhood hometown—back to Los Angeles. Watching your performance during the Macy’s Day Parade, it struck me that Kelly is both the leader and a member of the group. She has a way of informing the audience that you’re all playing an equal part in the performance. Not all artists make that effort for their band. That’s true. I’ll tell you a story. I couldn’t sleep the last night after the Macy’s Show—it was the end of our calendar, so I went down a You Tube rabbit hole watching all of our performances. I was looking back on the year and all the performances we had done and one cool thing I noticed about Kelly is that she has always responded to the band’s energy. Any time we’re done performing, she’ll finish her note and say: “Give it up for my band!” I’ve played with so many artists that aren’t like that. She doesn’t haveto be that way. You get the sense she likes the comradery in the band’s energy and she’s always very quick to give it up to the band and the production crew. Which is super, super fun. For me as a bassist, it’s a really cool gig because I’m not standing behind a video wall and there’s not 28 dancers on a platform. You’re right thereand you get to feel the contribution you’re making. And she’s so responsive too, which is the fun part. She really will turn around if I play a good lick and say, “Hey!” You don’t always get artist gigs like that. What kind of challenges do you have as a bassist in making sure Kelly has enough room to break free if she gets inspired? A good bassist can make or break a vocalist. I really try to be aware of where she is not only dynamically and harmonically but physically on stage. I want to make sure the focus is always on her. Once you earn her trust, it’s up to you to wield your individuality graciously. You have the freedom to do whatever you want, and I take that freedom seriously. Me and Lester, the drummer, will sometimes go in-on parts but it has to be parts where we are either supporting her vocal by creating some energy or dynamic lift, or we’re backing away and giving that vocal space. In the right moment, if you’re playing something cool, she’s going to go in a little harder too. All of that knowledge comes with a lot of care. You have to set that up properly. And otherwise stay out of her lane. She also responds very well to the rock thing. She wants someone that’s not timid. You have to come with it. I saw a video from when I first started--my first gig--which was more or less an audition during a filmed recording session at Starstruck. I was really thrown into the fire. It was like: Hi Kelly, I’m your bassist. “1-2-3-4!”…(laughs).And not only are you playing the songs for the first time with no rehearsal but it’s being filmed, and it’s also being recorded. So really quickly I had to remember to be myself, be bold, but pay attention so that I’m putting my best foot forward. I remember being told in Nashville you have to come with it. She likes the rock energy, but I think some of the previous players had been very rock where as I can do rock, but I also grew up playing Jazz and Hip Hop. What’s your background and how did you get to Nashville? I moved to town in 1996—which kind of gives me an honorary native status I’d say (laughs). We moved from Los Angeles—I was 12 years old. My Dad, Kirk Whalum, is an acclaimed tenor saxophonist and had played with Luther Vandross and Whitney Houston and Barbara Streisand and Celine Dion. He’s kind of a big deal. When I moved here, I was into the visual arts. As we moved, I didn’t have any friends here and Nashville wasn’t what it is now. I found myself sitting in my room a lot and being a bored kid and so that’s when I discovered bass. Did you dream of becoming a professional musician at that point? I had always pushed against the family business so visual arts was my way to be creative. When I got here, I was introduced to Jimi Hendrix and I got into Foo Fighters and that’s when I decided I wanted to play drums. We lived in an apartment at the time, so drums wasn’t going to happen. Then I got into guitar, but I always felt like a drummer and that’s when I got into the bass. I think bass makes sense because it’s in-between the two, and you’re very much an accomplice with the drummer. And I really dug that part. I picked up the bass around 13 and went to the Nashville School of the Arts here. Then I went to Belmont to study. I started working professionally as a bassist when I was 16. Sessions at 16! You were a quick study. Yes! I can’t remember the practicing, but I know I was obsessed with it. I know I was practicing eight or ten hours a day. It was always on me. Pretty quickly I got good and started doing sessions and doing tour stuff. All through college I was on tour. I was always trying to do homework on a bus or a jet. From there, I got into a lot of country music around 2006 which was really fun because that was more foreign. I liked the challenge of figuring out how to absorb country and play it authentically when that’s not my experience. And Nashville was changing dramatically in those years. I remember on the drive up from Los Angeles, I had just got into music. I was listening to Oasis—What’s the Story Morning Gloryand the Wallflowers’ first album on repeat. And the Wallfowers was me trying to get ready for whatever Nashville had in store. Warner Brothers had given my Dad a collection of country music to listen to. On the way down to Nashville we listened to Roger Miller, Hank Williams, all the classics. When we showed up, the first thing I did was become aware of the Bela Fleck and the Flecktones and more of the artsy-jammy scene. Even when I first showed up, it already had a broad musical spectrum for an outsider and of course we had all the honky tonks. The Dixie Chicks were taking off and the pop sound was starting to take off. I gravitated toward that stuff. My sister and I became pretty big Dixie Chicks fans. Country is what we’re known for but there’s so many other things happening here. I dig that because I do listen to everything. I hope that someday Nashville can just be known as a music town and not just a country town. We know that it’s true. I kind of thing the pop thing and the Hip Hop thing we’ll see more of going forward. What stands out to you about Nashville musicianship? Out of LA, you see good looking bands. In Nashville we may not look as slick but the playing and the connection with the instrument you’re wearing is so much more natural and raw and primal. Nashville players have to be able to go in a room and play live with a singer. We’ve still hung onto the process before it got digitized. It’s still tactile. We’re still a guitar town, a drum town, whereas LA is at the forefront of pop production. The players out of Nashville are a little bit more organic. I plan to move back to LA so I look forward to the mashup of bringing the organic side of things to the pop epicenter and see what I can bring. When I move to LA, I look forward to putting my writing hat and my producer hats back on. I studied arranging in school. I’m familiar with instruments and their registers and what they do and how they function. I’m a musical guy, I come from a musical family. My father is great, my Uncle Kevin is a great singer. 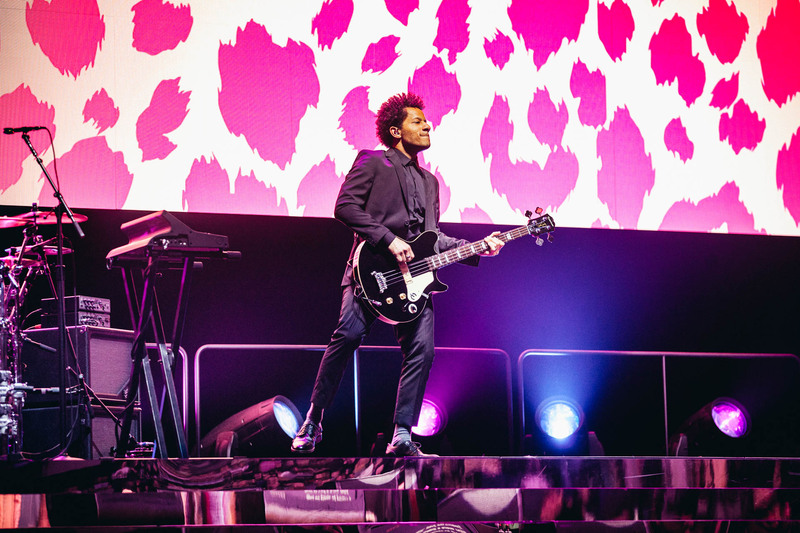 My cousin Cameron plays with Bruno Mars—he’s a great trombonist, producer, and artist. My cousin Kenneth plays with everyone—D’Angelo, Jay Z, Kanye West. I come from all this music and it’s always circling me. Bass is what I do the best I think but there’s more to it than that. Bass—a lot like piano—you have to have this understanding, since you’re the bottom layer, how you’re effecting all the layers on top of you in the whole picture. When you’re down closer to the root next to the rhythm and the harmonic structure is being stacked on top of you, you’re kind of aware of all that stuff. Pianists have the same view. When they sit down, they have the whole spectrum laid out in front of them. They know what to add and subtract from the greater picture. Finally, I’m glad to see you on stage so often with your Epiphone Jack Casady Bass. Man, that JC has really quickly become a prized instrument of mine. I love hollowbody instruments. 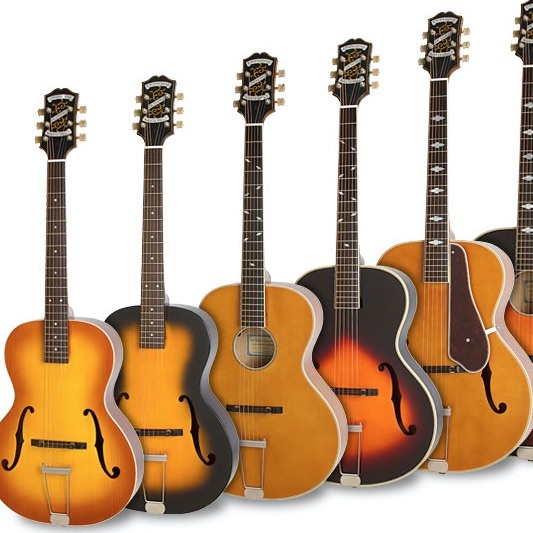 I had been leaning toward a Thunderbird when I first came to the Epiphone showroom. I took the Jack Casady home and I did a session with it the next day. It’s now become something I’m known for playing. The cool thing about it is because it is hollow, it has the propensity to fill that warm acoustic place, but it also has this high end that works for rock stuff. I keep flat wound strings on it right now but I might string up one of my Jack Casady’s with roundwound strings so I can get even more of a rock sound. It’s super flexible. If you’re playing it up near the neck, you’re going to get this really warm upright sound. If you’re playing near the bridge with a pick, you’re playing punk music. I’ve always loved seeing players that would take funky instruments and squeeze them into slots where they might not traditionally go.